Guys, I'm finally a proud owner of a gold Sharpie pen. I know what you're thinking, "Really Selene, really? A Sharpie pen?" I know. I was disappointed in myself too. I may or may not have attacked several items around my house with that gold Sharpie pen since purchasing it last December. One of the victims: this jewelry bowl that had already been attacked with white spray paint. 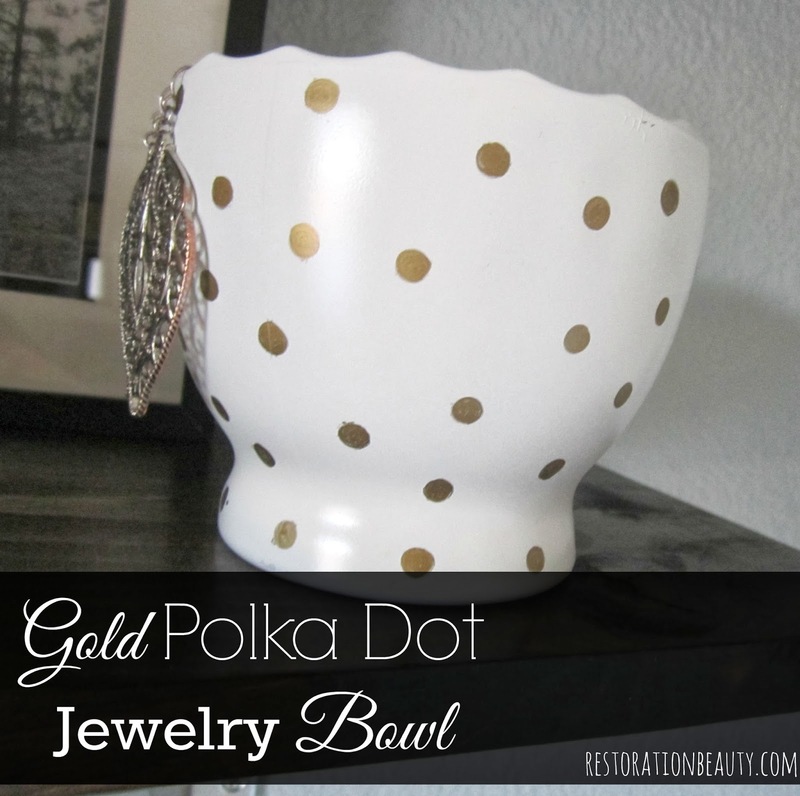 Who doesn't love gold polka dots? Or polka dot anything? I'm quite the sucker for them. 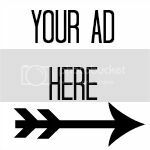 Have you seen my Necklace & Bracelet Organizer? 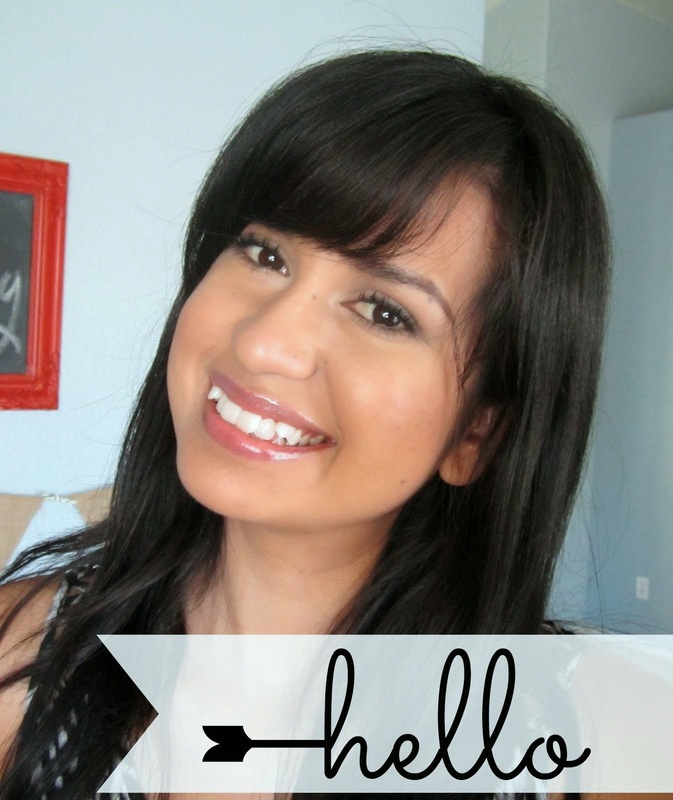 The process was super easy and thrifty- just like all my DIY's! 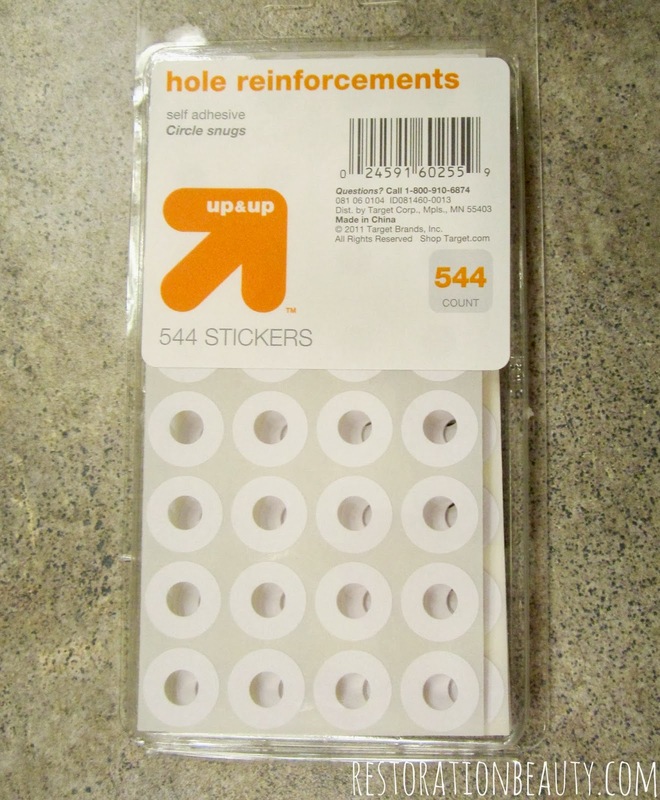 I grabbed some of these hole reinforcements at Target since I had seeing another blogger use them in a similar project. I cannot for the life of me remember who!! Please, if it's you let me know so I can give the proper credit. Anyway, these were under $2 and my gold Sharpie pen came in a pack of 3 for under $5. I got home and went to work- wait, does this even count as work? 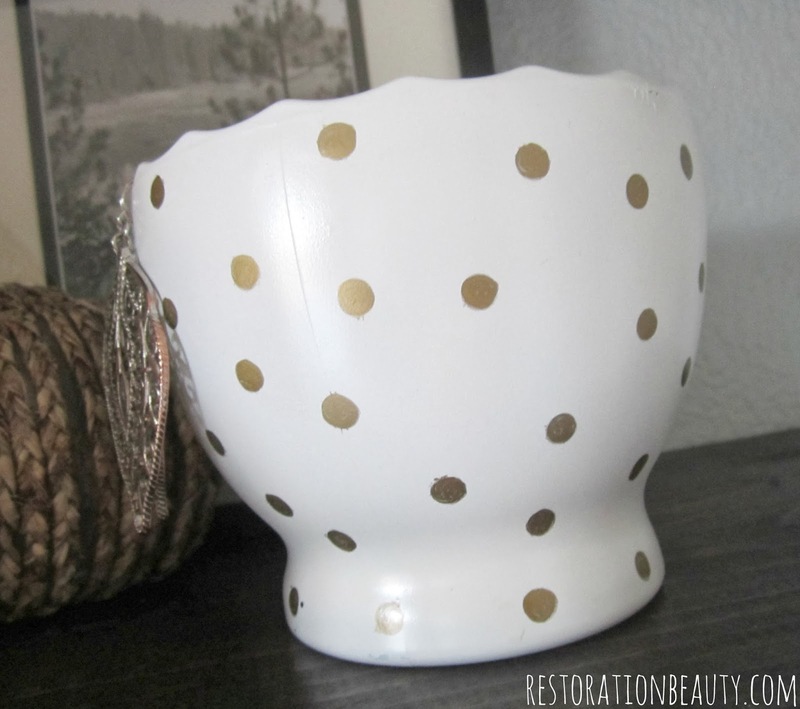 I placed a bunch of hole reinforcements all over my jewelry bowl and colored inside of them. That's it. Well, other than peeling them off afterward. 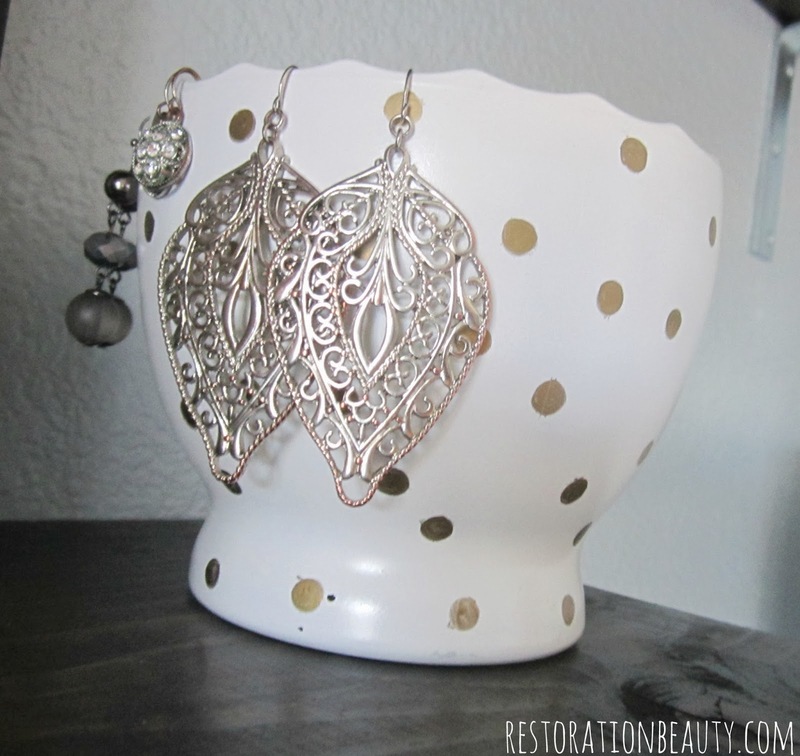 I use the edge of the bowl to hang my dangly earrings and it works perfectly! I just love quick and easy updates like these that make such a difference, don't you? 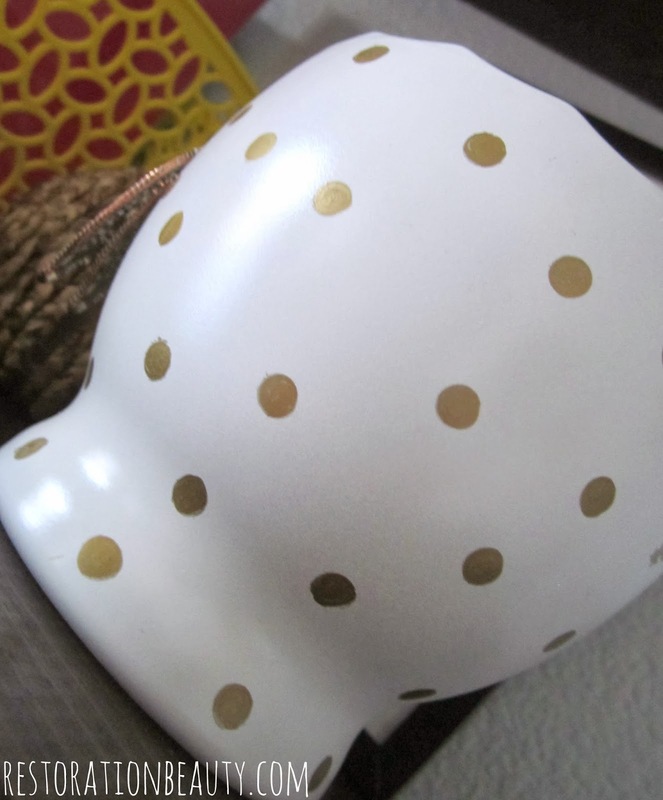 Do you all love polka dots and Sharpie pens as much as I do? This is great, Selene! You did a wonderful job...there's no way I could have spaced the dots so evenly. :) I love little bits of gold around the house. Have a nice weekend! Thanks, Lisa! I sorta just eyeballed it, you know me...lazy methods all the way! 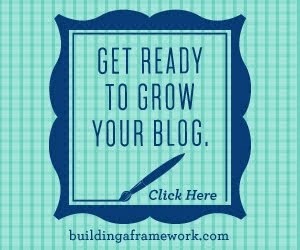 Great idea Selene - I'm going to try this! Caught my eye over at The DIYers Party. Thanks, Marie!! So glad you liked it! that turned out super cute selene, i have been wanting to buy a gold sharpie but the last time i went to hobby lobby i cannot find it, for the love of God it might be just staring at me! i am so getting that this weekend! This is adorable! I love the idea and especially the gold. Thanks so much, Kimberly! I'm quite the sucker for all things gold!! Thanks, Chelsea! I'm quite addicted to the gold sharpie pens now! Thank you, Julia!! You're gonna love your sharpie!! Thanks, Summer!! So we are gold sharpie addict sisters!! Ha! I am obsessed with hunting down jewelry storage ideas!! Oh me too! Please always post about jewelry storage. I am totally lacking! But that's not to say I won't post anything new! ریموت مارک جنیوس خیلی سخت پیدا میشه. شرکت فعال در زمینه نصب راهبند اتوماتیک در تهران و شهرستان ها کشور ایتالیا انواع برندهای راه بند اتوماتیک را تولید می کند ما بفروشیم. ریموت مارک جنیوس خیلی سخت پیدا میشه. کشور ایتالیا انواع برندهای راه بند اتوماتیک را تولید می کند ما بفروشیم. ریموت مارک جنیوس خیلی سخت پیدا میشه. کشور ایتالیا انواع برندهای راه بند اتوماتیک را تولید می کند ما بفروشیم. سفارش پایان نامه و پیاده سازی, اجرای پایان نامه تز پایانی یا انجام پایان نامه خود را به افراد با تجربه بسپارید. پايان نامه کارشناسي ارشد و انجام پايان نامه دکتري سفارش پایان نامه و پیاده سازی, اجرای پایان نامه پايان نامه کارشناسي ارشد و انجام پايان نامه دکتري سفارش پایان نامه و پیاده سازی, اجرای پایان نامه پايان نامه کارشناسي ارشد و انجام پايان نامه دکتري مخزن لباسشویی ما خرابه تعمیر نمیشه. هزینه تعمیر لباسشویی در سطح تهران غیرمتعارف شده. تقلید شستشوی دست توسط ماشین لباسشویی. مخزن لباسشویی ما خرابه تعمیر نمیشه. بچه ها یکی نیست یه آتلیه بارداری خوب بهم معرفی کنه ؟ قیمت مهم نیست برام . تقلید شستشوی دست توسط ماشین لباسشویی. ترجمه روان ویژگی یک مترجم فارسی به انگلیسی خوب است. تعداد ستون های موجود در مقاله در تعیین هزینه ترجمه فارسی به انگلیسی تاثیرگذار است و ریز وو درشتی متن هم همچنین. متن تخصصی فارسی را هرکسی نمی تواند ترجمه کند. I just love the earrings!!! It will suit both traditional & western outfits, I don't think it will lose its charm or polish.